Wind power, one the oldest and most established forms of alternative energy, might not be as green as we thought. A new study in the US has linked wind farms to local temperature rises of over 0.7°C—enough to change local weather and climate. 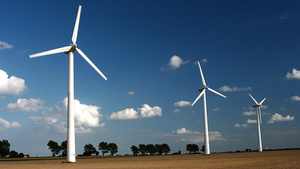 "We attribute this warming primarily to wind farms... These changes, if spatially large enough, may have noticeable impacts on local to regional weather and climate." The heating, it's suggested, is a result of the energy created in the farms, as well as the movement and turbulence generated by turbine rotors. Interestingly, most of the heating occurs at night: it's speculated that, while the earth usually cools after the sun sets in turn bringing down the air temperature, the turbulence that the turbines produce keeps the ground around them warm for longer.